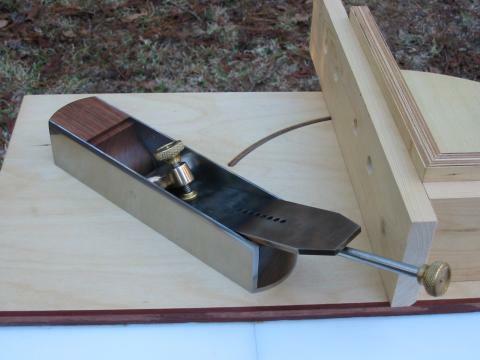 This miter plane is based on the Norris A11 which was a new design for the A11 and was offered by Norris in the later years of the firm’s existence. (There were two A11 styles offered previous to this incarnation). I chose this design because I wanted a plane for my shoot board that had plenty of side area so the plane would be easier to use and less likely to tip out of square when shooting a joint (i.e. more accurate to shoot a true 90 degree from the horizontal plane). The sides have almost as much surface area as the sole. I had always admired this style of plane in spite of its "boxy" straightforward appearance. It seemed the perfect mate for a dedicated shoot board. This design is shown in a Buck & Ryan catalog from 1938. 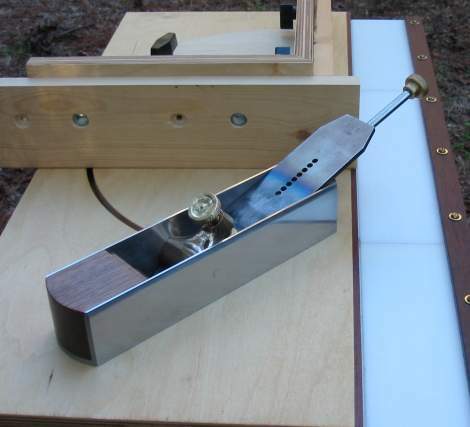 The plane measures 10 ¼" long by 2 ¼" wide with sides that are 2" high. The 3/16" thick iron is 2" wide. It weighs 5 pounds 2 ounces. The weight is really a plus when shooting hard and/or thick material. 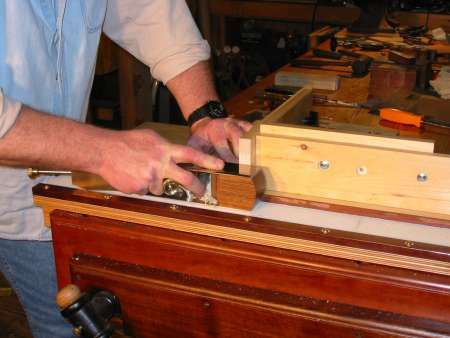 The sides are joined to the sole with "double dovetails" (these joints are not visible on this plane since I used O1 steel for both the sides and the sole). The .002" mouth opening is achieved by splitting the sole and rejoining it with a tongue & groove joint. I used grenadillo for the infill stuffing. The rivets that pass through the plane and hold the infill in place pass through 9/16" diameter brass rod that was inserted into the infill before I installed it in the plane. This brass rod is then drilled through for the rivets once the infill is in place. This insures that the sides do not move with the infill’s dimensional changes caused by chances in humidity levels. The adjuster was made for me by Bob Howard at St. James Bay Tool Co. The stem is about three inches too long so I plan to send it back to Bob so he can shorten it for me. This particular plane took a bit longer for me to complete due to the requirement that the sole and sides be perfectly square to one another. If they were anything less than square the shooting process would not be accurate! Here is a shot of my plane in use. After I finished the plane I decided to build a new shoot board especially for it. 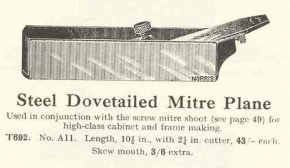 I had admired the Rogers Miter Planer, a beautiful cast iron tool that was made many years ago. I particularly liked the adjustable quadrant and fence that allowed an infinite degree of miter settings. 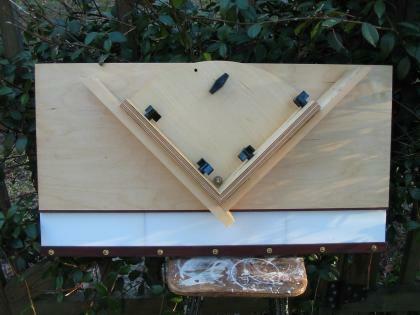 And, since the quadrant’s two faces were 90 degrees from one another you could shoot each side of the miter joint without having to reset the fence. The Langdon had a dedicated plane that had two irons (one facing each direction). The concept still works with my plane by simply flipping the plane end to end to shoot the opposite side of the joint. 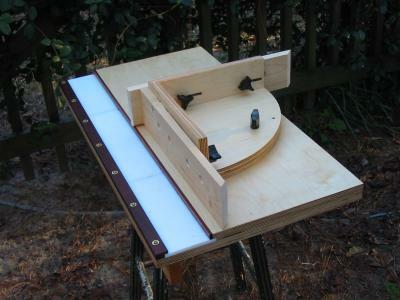 the quadrant set to shoot a 45 degree miter.